It is not having a pulse, at least not merely. Having a pulse is a necessary condition of the good life, of course, but it is not sufficient. A good life requires more. It is not experiencing pleasure either, at least not simply. Of course, pleasure is generally better than pain. (I am a chronic pain sufferer, so I know whereof I speak.) But not all pleasures are created equal. Not only is the pleasure of doing right better than the pleasure of doing wrong, but even the pain of rightdoing is better than the pleasure of wrongdoing. In other words, better to suffer in the cause of justice (Martin Luther King Jr.) than to benefit from injustice (Bull Connor). But Timothy has just now come to us from you and has brought good news about your faith and love. He has told us that you always have pleasant memories of us and that you long to see us, just as we also long to see you. Therefore, brothers and sisters, in all our distress and persecution we were encouraged about you because of your faith. For now we really live, since you are standing firm in the Lord. In this paragraph, the missionaries mention two pains they had experienced: “distress and persecution.” The two were related. Both the missionaries and their Thessalonian converts had been on the receiving end of persecution since the founding of the church (Acts 17:5–9; 1 Thes. 2:14, 3:3). The missionaries, being strong in faith, did not worry about themselves. But they were distressed for their converts, not knowing whether their nascent faith had survived the onslaught of opposition. So here, if I understand it, is the good life’s complicated calculus according to Paul, Silas, and Timothy. In general, pleasure is better than pain, and pleasure in pursuit of good is best. But pain in the pursuit of good is better than pleasure in the pursuit of evil. Pleasure from friendship in the Lord is better than pleasure from any other source. To live is to be friends in the Lord. Everything else—pleasure, comfort, whatever—is gravy. In this video, Doug Clay talks about Leviticus 20:7-8. Every night since my son Reese was born, I have prayed this prayer for him as I put him to sleep: “Jesus, I ask that Reese would follow you from an early age.” Because Reese is three years old, it is easy for me and my wife Tiffany to create the conditions for this prayer to be answered. We attend church, pray and read the Bible together, and model the kind of life we think a Christ-follower should live. But there will come a day when Reese has grown up and must choose for himself whether and how to follow Jesus on his own. When that time comes, I will no doubt be praying with greater intensity. So when we could stand it no longer, we thought it best to be left by ourselves in Athens. We sent Timothy, who is our brother and co-worker in God’s service in spreading the gospel of Christ, to strengthen and encourage you in your faith, so that no one would be unsettled by these trials. For you know quite well that we are destined for them. In fact, when we were with you, we kept telling you that we would be persecuted. And it turned out that way, as you well know. For this reason, when I could stand it no longer, I sent to find out about your faith. I was afraid that in some way the tempter had tempted you and that our labors might have been in vain. Remember the context of these words: According to Acts 17:1-9, the missionaries spent several weeks evangelizing Thessalonian Jews and Gentile God-fearers. At some point, however, a coalition of Thessalonians initiated a mob action against the missionaries and new Christians, the former eventually fleeing the city under cover of night at the encouragement of the latter. These new Christians immediately began to suffer for their faith (1 Thes. 2:14, 3:3). Paul, Silas, and Timothy were worried whether their short, three-weeks’ work among the Thessalonians had laid strong enough foundations for them to withstand these attacks. They needn’t have worried, for the Thessalonians had stood strong. First, focus on Jesus Christ. The practice of Christianity goes bad when it begins to focus on peripheral issues rather than central ones. The missionaries’ preaching was simple: “This Jesus I am proclaiming to you is the Messiah” (Acts 17:3). If you want your children to follow Jesus, show them Jesus all the time. Second, expect temptations and trials. Following Jesus doesn’t mean an easy life. We are “destined for [trials].” Following Jesus helps us resist temptation and emerge victorious from trials. Third, keep the lines of relationship open so that you can communicate “encouragement and strength” whenever they’re needed. As your children age, your relationship with them changes. But the goal of your relationship doesn’t. You bear a responsibility of helping them love God, neighbor, and self. This is best done by encouragement, not nagging; by example, not command. Jesus, may our children follow you from an early age and throughout the ages. Amen! Author georgepwoodPosted on January 27, 2012 Categories Interesting1 Comment on Worst Church Singer Ever? 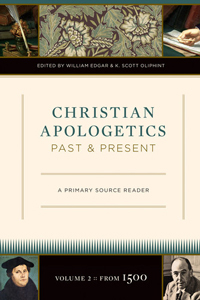 Christian Apologetics: Past and Present is a two-volume compendium of primary sources that document the variety of reasons Christians have given in defense of their faith over the two millennia of its existence. This second volume covers the period from 1500 to the present. The authors divide it into four parts: (1) “The Reformation, Post-Reformation (Protestant), and Catholic Reformation”; (2) “Modernity and the Challenge of Reason,” from roughly the late 17th through the mid-19th centuries; (3) “The Global Era: Christian Faith and a Changing World,” which covers the mid-19th through early 20th centuries; and (4) “Issues Today and Tomorrow,” which covers the mid-20th century to the present. Each section includes selections by authors from across the ecumenical spectrum–Protestant and Catholic–with Reformed evangelical authors receiving special focus in parts 3 and 4. Each part begins with an “Introduction” that frames the historical context the excerpted apologists worked within and concludes with a “Follow-Up” that briefly describes apologetic authors and works not excerpted for the book. I recommend both volumes for Christian apologists, pastors, seminary professors or readers, or laypeople interested in the historical development of Christian apologetics. If you found this review helpful, please vote “Yes” on my Amazon.com review page.